What would happen if we designers play with genes? Manipulation of the living disturbs. In question of bringing a new element to the body with prothesis (or implant), in sports mostly, and how it improves human performances was asked. Must we enhance or simplify life? In « L’homme simplifié: le syndrôme de la touche étoile » (The simplified man: the star touch syndrome), the philosopher Jean-Michel Besnier describes a man gets rid of all his complexities. For example, a project of a brain implant would permit to communicate directly with our minds. Thus excluding language which is one of the most important sources of human creation and richness. This implant would finally reduce our abilities and our liberty. But if we explore beyond the prosthesis and the will to improve our body’s aptitudes by adding new elements, we start to modify the living with living parts and genetic mutations. In 2006 at the Biennale du design of Saint Etienne (France), the exhibition « Eden ADN » (Eden DNA) shows designers’ and artists’ works about genetic engineering. Mankind is not the main focus but mostly botanic or animal trans-genesis are exhibited. However these projects are still impressive and offer, mostly decorative and sometimes with a function, different chimeras and fantasies. Genetically modified organisms are a controversial matter but have been a part of our daily life for centuries. Indeed, crossing species to obtain more resistant or more esthetic ones was always practiced and GMO is already hidden in our food. What happens when designers and artists work with genetics? 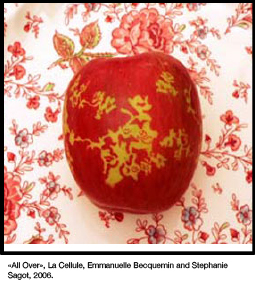 The project made by “La Cellule” (Emmanuelle Becquemin and Stephanie Sagot) is about putting masks on an apple during the last weeks of rapening and creating patterns on fruit’s skin. 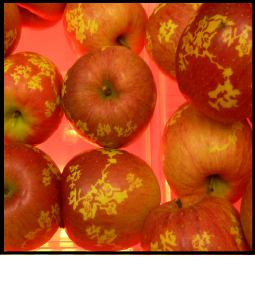 This ancient technique of photo-printing was used to mark the fruit with it’s producer’s symbol. In this case it merely has a decorative function. 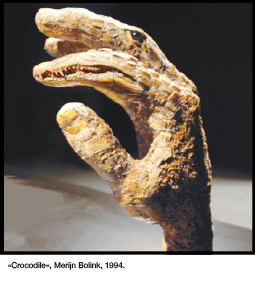 Many sculptures of the Dutch artist Merijn Bolink picture genetic fantasies and combinations. 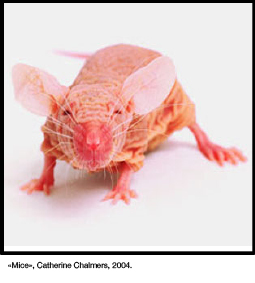 But the photographs by Catherine Chaimers of genetically modified mice for helping research against cancer are the most significant of reality but not dream. These bruised and transformed animals give us an overview of what is on the other side of those dreams and what dreadful things we can also create with the best intentions. This exhibition presents many decorative projects which are still uncertain about genetic issues and which did not dare to fully be involved in this controversial process. They remain marginal and allow themselves to highlight questions that are still actual. What would be tomorrow’s genetic issues? How could we avoid a non beneficial progress? What would be the consequences on the living? Can we recreate at our will like amateur demiurges? And which ethical rules shall we not break? « Demain, les posthumains. Le futur a-t-il encore besoin de nous ? », Michel Besnier Paris, Hachette, collection "Haute Tension", 2009. « L'homme simplifié: le syndrôme de la touche étoile », Jean-Michel Besnier, Fayard, 2012. Exhibition "Eden ADN", Biennale du Design, Saint Etienne, France, 22 November - 3 December 2006. Previous Previous post: I WANT TO BELIEVE: NO LIMITS?